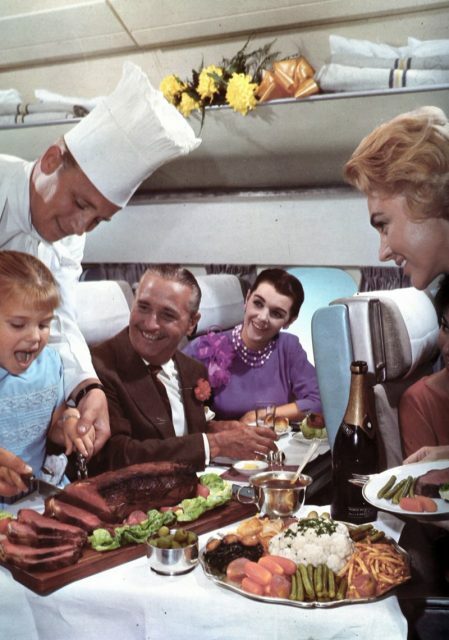 The 1950s and 1960s were considered the golden age of commercial flying. Though planes had been around for a considerable length of time – commercial flying for pleasure was still in its relative infancy. It was the domain of wealthy celebrities, politicians, and businessmen; ordinary citizens did not begin to view flying as a practical or realistic mode of transportation until the 1950s. So airlines needed enticements for a skeptical public, and they came up with an array of them to convince ordinary people that flying was a safe, fast, and viable alternative to trains, automobiles, or buses. 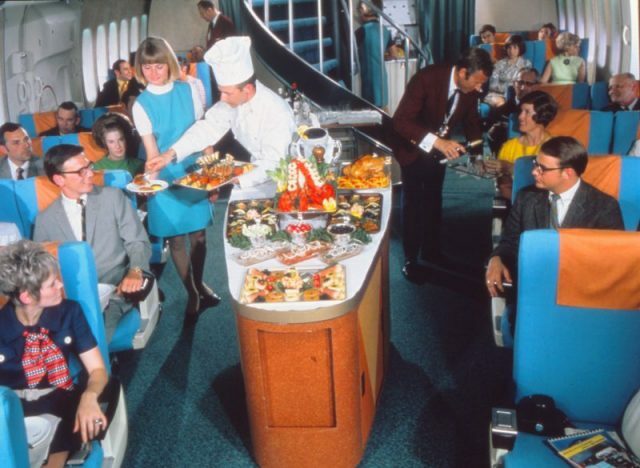 The inside of airplanes of yesteryear looked nothing like the cramped, overcrowded jets of today. 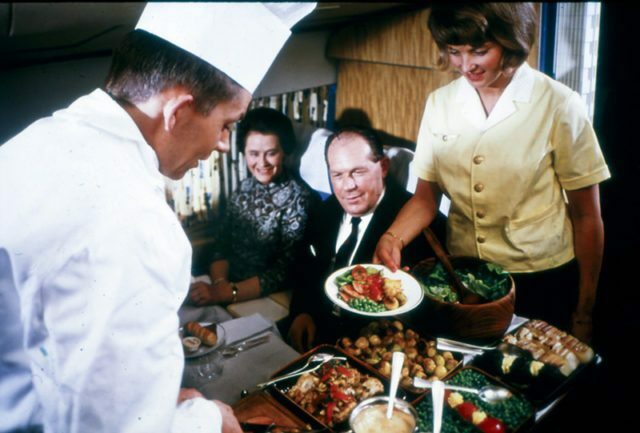 There was room to stretch one’s legs, free drinks, and stewardesses (as they were known back then) who brought meals and replenished alcoholic beverages at an alarming rate, at least by today’s standards. 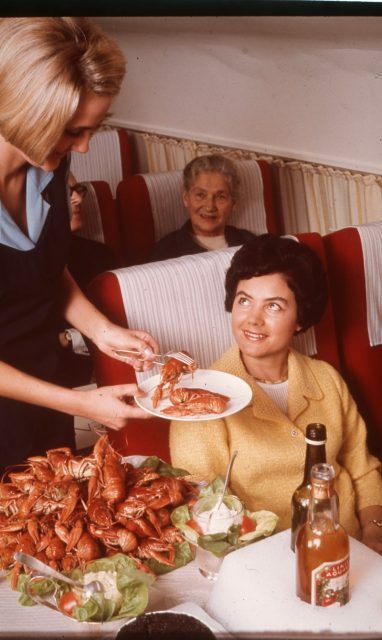 Airlines had to offer these lures in order to convince folks that flying was worth the exorbitant price of a ticket. Bargain fares and last minute deals were still a long way off. Only the wealthy could easily absorb what airlines were asking for even a short flight. One TWA ad from 1955 offered a ticket from Chicago to Phoenix for $138. Sounds reasonable, right? Not once it’s converted to today’s dollars – it jumps to around $1,200. 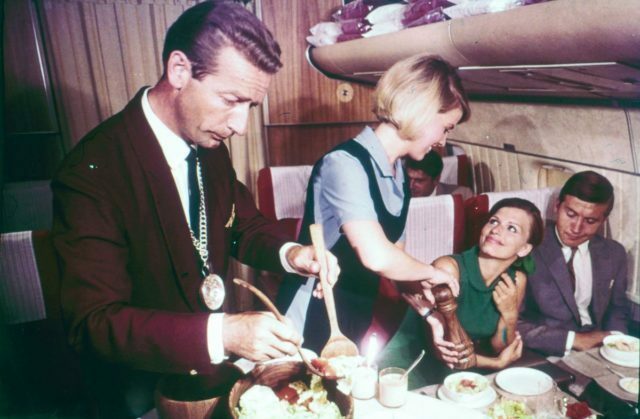 No wonder flying was such an exclusive club back then. 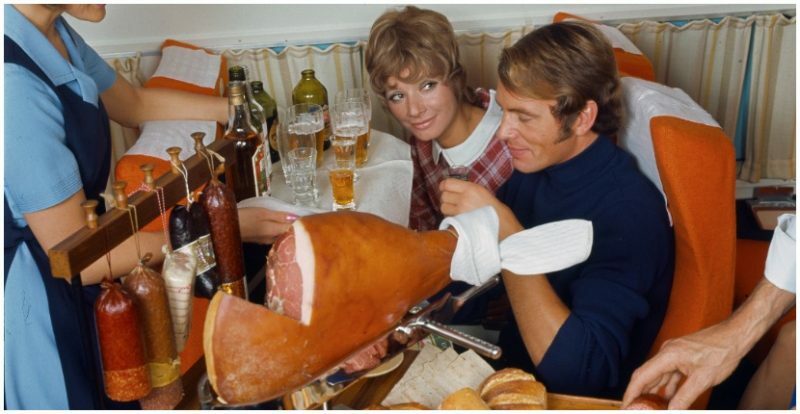 Since flying was considered an “event” in those days, people dressed for it. No sweat pants, hoodies, or sneakers were anywhere to be seen; men wore suits, and women dressed in their “Sunday best” and often donned hats and fine jewelry. It’s hard to imagine today when every seat is sold, people are crammed in at least three to a row, and often babies are carried on laps, but in the 1950s and ’60s, there were often seats to spare. 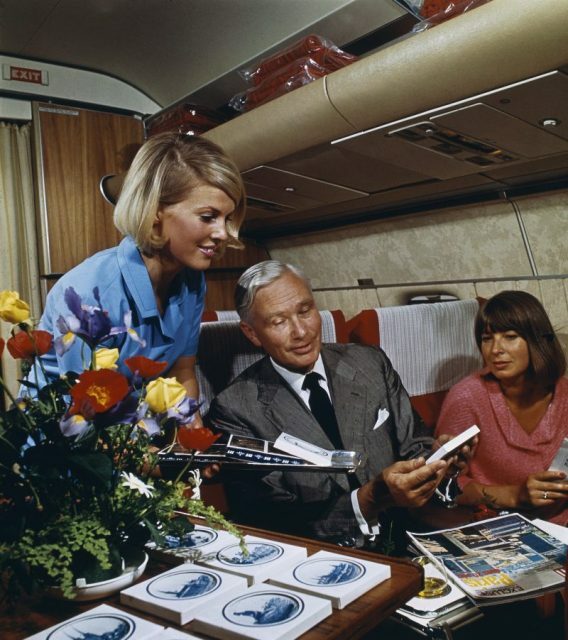 This allowed people to “spread out” a little, and women rested their purses beside them while men put their briefcases in front, in all that extra leg room. The aisles were also wider and there were fewer passengers to get in your way. 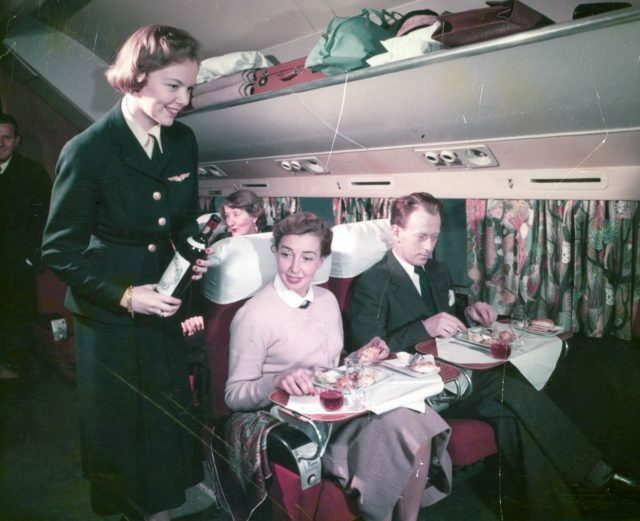 Also free alcohol, usually fine spirits, was served aplenty and passengers had more freedom and space to move about the cabin. This led oftentimes to plane trips doubling as impromptu cocktail parties. It was not infrequent that passengers would arrive at their destination a wee bit tipsy (to say the least). Conversations were hard to hear because the planes were louder and there was also considerably more turbulence. But that inconvenience was offset by the ease with which boarding a plane occurred; you just walked into the airport, put your luggage on the designated rack, handed in your ticket at a gate and strolled out on the tarmac. No security. No searches. No requests for identification and no surly guards grilling you mercilessly about who you were visiting and how long you would be staying. Bliss, right? 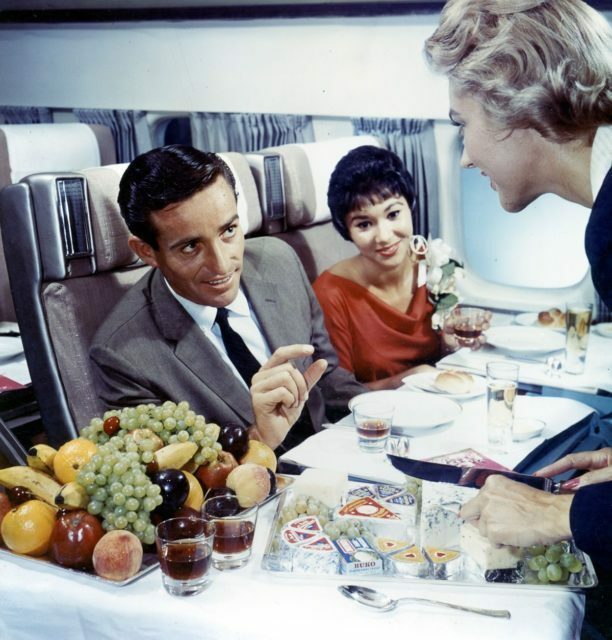 It might seem like those were the glory days of flying, a golden period in which leg room and decent meals, to say nothing of free booze, made steep ticket prices and noisy planes worth it. But planes are, today, considered the safest way to travel, and that’s because those golden years of flying are long gone. We are safer and more secure – if a little more cramped – in the skies today than we’ve ever been.